When talking about the use of digital media at home, most parents spontaneously mention various worries and concerns, wondering what would be the best way to mediate their children’s digital activities. They see how their children acquire new skills with new digital devices and content, but at the same time they want to avoid overuse and protect them from online risks. How can we help parents find a balance? There is no magic solution. Parents differ in their overall parenting style and level of digital skills. They have different questions and concerns, and not all are equally motivated to search for advice. We created five personas or ‘typical’ parents, and the two examples discussed here illustrate how parents deal with issues in media education in such different ways. Mary has no rules about online gaming and the internet. She does not intervene when she hears her boys talking about violent or sexual content they have seen online. She believes that her boys should discover the internet on their own. She has few questions or worries about her children’s media use and is not likely to seek advice spontaneously. Tips about active mediation and communication with children about digital media would be helpful for her. Daniel is convinced by the importance of strict rules, and believes this is the most effective and efficient way to mediate his child’s media use. He felt irritated about Fiona’s social media use during dinner or other family activities, so he has a rule of putting smartphones aside while eating and leaving the device in the living room at night. He installed a parental control app to keep an eye on his daughter’s social media use. Tips about how to negotiate agreements with teenagers about their online activities would be helpful for him. It provides various types of content such as self-assessments, short articles, bullet point lists with tips and tricks, funny videos, click & print, etc. It uses very simple and accessible tags to filter content on specific topics (e.g., online privacy, online bullying, gaming, social media) and children’s age, to ensure that parents can navigate the site easily. To connect with a wide range of parents, it has put a lot of effort into promotion strategies, e.g., via the Flemish public TV channel for children. What was our contribution as researchers? 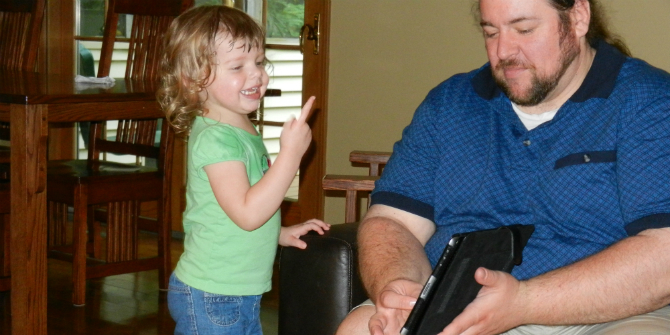 How can I talk with my children about digital media? When it is okay to forbid my child something? How can I make rules about digital media with my child? It is okay if I check the browser history or online messages of my child? How can I lock their device? Under this heading parents will find information about the two most common ways to install parental controls, i.e., ‘Change the settings of your device or app’ and ‘Download software’. Clicking on the black arrow, they get more detailed instructions. 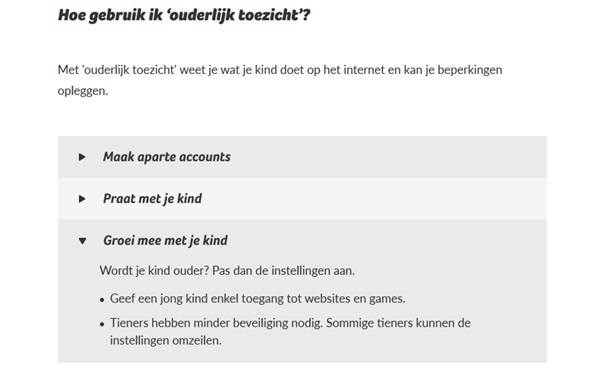 Parents further receive tips on how to use parental controls, for example on how to ‘Create separate accounts’ [Hoe gebruik ik ouderlijk toezicht], ‘Talk with your child’ and ‘Grow with your child’. Clicking on the arrows, reveals more detailed information on each subject. For example, under the heading ‘Grow with your child’, parents find instructions on how to differentiate mediation between young children and teenagers, e.g. it is okay to restrict access to certain websites or games for young children, while for teenagers, parents should keep in mind that they need less supervision and sometimes even circumvent parental controls. As a final piece of advice related to parental controls, MediaNest encourages parents to ‘Try out’ [Test uit] what they have changed or installed. For example, if they put a lock or password on Apple’s App Store, they should try to download an app using their child’s account, in order to ensure this is no longer possible. 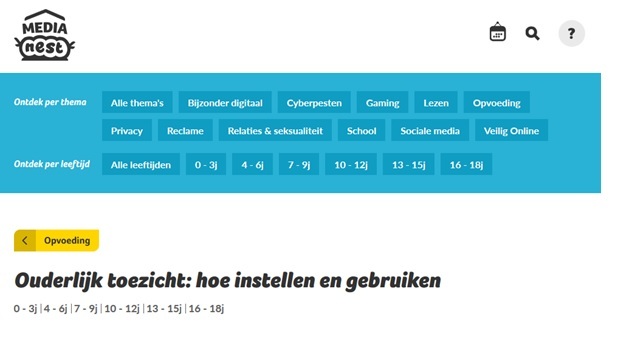 MediaNest is an initiative of Mediawijs, the Flemish Knowledge Centre on Media Literacy, in collaboration with Linc vzw, MIOS (UAntwerpen), DiGRA Flanders, Sensoa, Privacycommissie, Gezinsbond, VAD, Child Focus, Klasse, Link in de Kabel vzw, Tumult vzw, EXPOO, AdLit, School for Mass Communication Research (KU Leuven), Mintlab (KU Leuven), UCLL, iMinds-MICT (UGent), Department of Educational Studies (UGent) and Ketnet. With expertise from: SMIT (VUB), Cemeso (VUB), HIG/Odysee, Luca-School of Arts, Gezondopvoeden.be, GO!-ouders, Awel, Mediaraven, Vormingplus Antwerpen, Provinciaal Veiligheidsinstituut Antwerpen, CAD Limburg, Centrum Kauwenberg, Cultuurconnect, Jong en van Zin, Jekino, VOCVO, Vigez. With support from the Flemish Government and Minister of Media Sven Gatz.